Meghan Cochran's sweet portraits pay tribute to 12 varieties of the perfect food. Whether you call them an indulgent breakfast or sweet coffee break companions, we're with you: Doughnuts are the perfect food. Don't they deserve to have their portraits painted? Meghan Cochran says yes, rendering twelve enticing varieties on her easel in oil, reproduced here in framed, digital prints that retain each frosting—er, brush—stroke and even the illusion of canvas texture. All of her subjects were enthusiastically approved by Meghan's taste-testing team (her two toddler daughters). From classic glazed to pink frosted with sprinkles, her tributes to these treats make tasty additions to your decor. Made in Oregon. We spoke with Meghan about her many loves, from baked goods to her kids, on our blog. Meghan Cochran is a wife, mama, and artist working out of her studio in Bedford, New Hampshire. 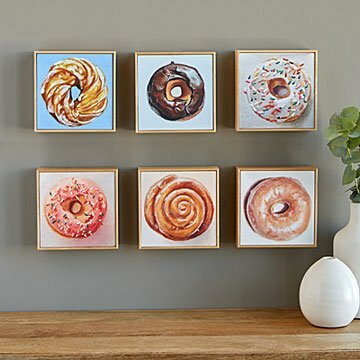 Her doughnut paintings serve as mini devotions to her sweet daughters’ wide-eyed wonder of the world. They’re her way of going back to childhood, being completely absorbed in the magic in everything. She earned her BFA in Painting from the New Hampshire Institute of Art, where she learned that alizarin crimson and phthalo green make the prettiest black when mixed. Creating art is her way of untangling seemingly unrelated events and experiences, and meditating on her innermost thoughts and desires. This was a going away gift for a great co-worker. The painting and frame are exceptional quality. I was very impressed! Would recommend it! I love this picture! I got the Cookie Crumble version. It sits on my desk at work and makes me smile whenever I glance over at it. I am already trying to decide which one to get next, they are all very pretty and well-made. These are the perfect addition to my kitchen. They're so cute and well made. Love them!